Thanks to the permission of the moderators to create this thread and introduce our box to the forum. We are the developer and manufacturer of the box to be reviewed. It comes after months of continuous hardware and software effort. We would be pleased if it is accepted by the forum members. There are so many of the Android players in the market, most of them do not have a tuner support. We therefore developed the box to give all the reception possibility to have just one-box-for-all in the living room. The reason Hisilicon is chosen over Amlogic is due to the video quality primarily. We want to have a box to display good image in the first place. The way the hardware is designed allows users to choose the best combination of tuner options preferred, DVB-S2+T2/T/Cable, DVB-S2/ATSC or DVB-S2 twin tuner. Both of the tuners could be used simultaneously, in other words, you could watch channel on one tuner and record on the other. The board called W96M_MAIN VO.4 feature the HiSilicon processor with a heatsink, an 8GB FORESEE NFEFEH68-08G eMMC flash, two SKhynix H5TQ4G63AFR DDR3 chips (2x 512MB), and Realtek RTL8188ETV Wifi module. If we zoom in on the tuner area, we can see AVL6762TA DVB-T2/T/C demodulator, and on the main board itself and located on the bottom right of the picture above, Hisilicon Hi3136 is the DVB-S2/S demodulator. There’s also two LEDs, an IR receiver, and a 4-digit LED panel on the front of the board. There’s basically nothing on the bottom of the board, except S1 switch which should be the firmware recovery button. The software is based on Android 4.4.2 which is a little out-of-date. The delay was due to the intensive coding to create an integrated UI style that caters for both traditional DVB and Media player users together with some handy functions. The main menu is more traditionally DVB feeling. A shortcut to Android applications is there. The DVB menu is easy to use and comprehensive. Recording and time shift are smooth. The box supports TVheadEnd. If the box is put to standby, channels coming through tuners could be watched with a smart phone, pad or computer through Kodi. You can zap on the other device and even initiate a recording. Of course, both devices have to be in the same router. It is also possible to watch the box when you are away from it. Though the port forwarding settings are a bit complicated. If any body is interested in the box and wants to get one, please go to the thread in the BuySell and Trade . Latest update of firmware on Feb 17th,2016 could support both Android phone and iPhone with TVHeadEnd. Applications are available in both Google Play and Apple Store. This is as delivered, so it should be exactly as you would receive one. Last edited by oceanboy; 09-03-16 at 10:21 AM. Seriously, i did not hold much hope it could do what it claimed, but it does it with ease. We have all lost count of products that make claims, then we can't seem to make preform as advertised. So, i will try and review it in sections. Otherwise, what is the point of a review. Might be small thing, but i hate nothing more than a laggy poor preforming RC. You could use this unit purely as a HDTV (MPEG4 capable) DVB-T set top box for an older TV and just leave it at that. It operates just like store bought HDTV Set Top Box, no lagging, fast channel change, great EPG... done. Especially considering it works smoothly and zaps fast. The U4 has a very dull green LED, its tiny, it will never be an issues. The front also displays the channel you are on in a very faint display. Once again, it is never going to be an issue in a bedroom or alike. Last edited by oceanboy; 09-03-16 at 10:07 PM. And set-up was a breeze, seriously easy! Unit comes pre installed with Australian Sats and Terrestrial regions. Last edited by oceanboy; 09-03-16 at 03:27 PM. As easy as any Sat box i have ever used, probably the easiest. You can also select channels to be the Favourites List. HD channels suffer a small buffer for about 1.5 seconds when loaded, then it plays perfectly. 9HD running as if it was any TV in the house. The unit has soft-cams included if you know what to do with them. Last edited by oceanboy; 09-03-16 at 09:36 PM. So at this point in the Review, you might be happy to just leave it there. I think, for the price, its already punching above its weight. But, look further and you have everything an M8 Android Box has, only it works a lot smoother. By that i mean, some of the functions are simply build into the Home Screen with the default firmware. Unit needed to be power cycled to recover. Last edited by oceanboy; 09-03-16 at 04:12 PM. Playstore is also loaded and works just fine. Last edited by oceanboy; 09-03-16 at 04:25 PM. If you have any questions, fire away. But its been a walk in the park. You only need dig into the OSD if your looking to do something more complicated. Been watching 9HD all afternoon on my Samsung Series 6, and i cant tell it's not the Samsung Built in Tuner, just looks the same. I'm sure the Quad Core Processor has a bit to do with it, as tasks i am used to doing on a Linux Sat Box and just handled so much faster and smoother on the U4. Last edited by oceanboy; 09-03-16 at 06:42 PM. which one did you purchase OB ? @ about US $106.69 ? Last edited by OSIRUS; 09-03-16 at 05:59 PM. Links are in the first post. Sorry OSIRUS, i just re read you question correctly. Last edited by oceanboy; 09-03-16 at 06:41 PM. You can also stream what ever channel is playing on the U4 Quad Hybrid to you laptop or tablet/phone. Last edited by oceanboy; 09-03-16 at 06:27 PM. Hopefully people aren't still looking for the review i said i'd post in another thread as this one is labeled Unboxing and Teardown. Great suggestion allover, i hadn't even considered that yet. Just being able to remove 1 box and remote and power adapter is a great plus, it really cleans things up and frees up power points. 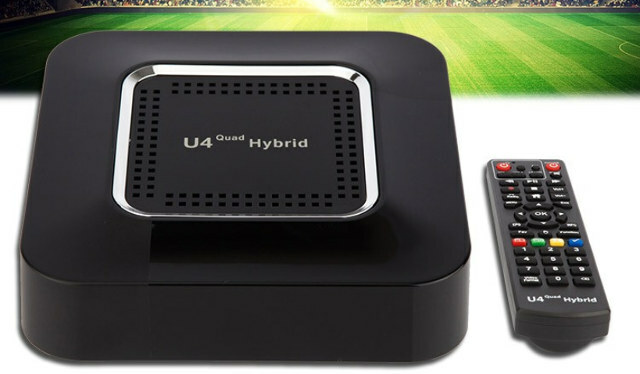 Not to mention the U4 Quad Hybrid can be completely hidden out of sight when you use a WiFi Remote. Last edited by oceanboy; 09-03-16 at 06:46 PM.